EU wheat futures closed mixed, with profit-taking cutting Paris prices, whilst a weak pound supported London levels. November Paris milling wheat closed down EUR1.50 at EUR146.25/tonne, whilst November London feed wheat ended up GBP0.75 at GBP123.00/tonne. 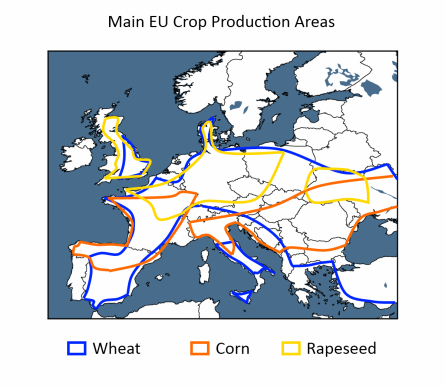 EU crops are looking generally patchy. Certainly in my part of the UK winter wheat looks rather poor as rainfall during the past three months has been well behind normal. Indications are that this situation has been replicated across much of France and Germany. Russian spring wheat plantings are well behind schedule, this time due to excessive wet weather, whilst some reports emanating from India indicate that their winter wheat crop has suffered due to weather. With elections in India imminent, the government are remaining tight-lipped about potential production and quality losses. May corn closed at $3.77, down 4 cents. The jury is still out on corn plantings, we will get a better idea on Monday, but only after the close, what progress has been made this week. Opinions are widely differing, based on the best information I have to hand right now, it seems that the US will be split in two next week along a line roughly South West to North East. East of the front…record-breaking heat along with gusty winds will warm and dry the soil from Iowa to Ohio. West of this front much colder and wetter conditions will prevail. Private exporters reported sales of 116,000 MT of corn to unknown overnight. May soybeans finished at $10.40 ¼, up 2 ½ cents. Export sales of 120,000 MT of soybeans for delivery to unknown destinations during the 2009/2010 marketing year were reported today. The Argentine crop keeps shrinking. StormX note in one of their newswires that the main areas of Argentina and Brazil left to harvest are the ones that contain the biggest potential for further yield losses. With virtually no rain in the forecast for these areas over the next week, crops here will only get smaller. May CBOT wheat finished at $5.32 ¼, up 3 cents. As spring wheat plantings in the critically important state of North Dakota remain virtually non-existent, July Minneapolis finished up 27 ½ on the week. Eastern North Dakota and Minnesota will get some relief from precipitation over the next 6 to 10 days from April 30 to May 4 according to the National Weather Service but temperatures will remain below normal not allowing for much drying of the soil. Crops in Russia and parts of Europe are also looking under threat due to weather concerns, and plantings in Argentina could be 18-20% lower according to some reports. eCBOT grains closed with little change Friday, beans were around 1-3 cents lower, with corn down 1-2 cents and wheat around unchanged. China keeps coming back for more US beans, with the USDA confirming another week of solid export sales yesterday. Latest figures from the Chinese Ministry of Commerce show that they took the best part of 4 MMT of imported soybeans in March, and are set to take similar amounts in April and May. The March figure of 3.86 MMT is up 67% on year ago levels. Given the magnitude of these figures, and the ongoing problems with both production and the threat of supply disruptions from Argentina, old crop US levels should remain steady for the time being. The Buenos Aires Grain Exchange cut its estimate for the 2009 soybean crop there to 36.2 MMT yesterday, from 37 MMT a week ago. That means that they have now lopped 3.2 MMT off Argy output in the last fortnight. Wet weather is seen delaying corn and spring wheat plantings in the US, which is supportive for those products, but possibly ultimately bearish for new crop beans. Crude oil is back up above the $50/barrel mark, despite huge US inventories. Early calls for this afternoon's CBOT session: Corn futures expected to open 1 to 2 lower; soybeans 1 to 3 lower; wheat steady to 1 higher. The German biodiesel industry is in disarray, running at little more than 50% of capacity, and struggling to survive governmental plans to phase in taxes on biofuels to the same levels as those on fossil fuels. The golden fuel has been also been hit badly by the economic recession, falling crude oil, and the exploitation of the "splash & dash" loophole by the US and other major biodiesel producing nations like Brazil. German consumption of biodiesel in 2009 is likely to fall to 2.5 million tonnes, down from 2.7 million tonnes is 2008, and almost 25% lower than the 3.3 million tonnes used in 2007. Yet the German biodiesel industry has a capacity to produce 4.8 million tonnes per annum. An industry spokesman said that biodiesel sales at the pumps had fallen from 1.8 million tonnes in 2007, to 1.1 million tonnes last year and are now just a trickle in 2009, with only 250 petrol stations left offering the fuel for sale on forecourts across the country. After much prevarication, the EU Commission finally slapped punitive import tariffs on US biodiesel imports in March, but this seems to be too little too late to help German producers. Faced with proposals to cut the the blending level in fossil fuels from 6.25% to 5.25%, the folly of an industry built almost entirely around government subsidies and mandatory legislation lies idle. North Dakota wheat production may be reduced 25% due to serious planting delays that will shrink the wheat acreage sown, while also reducing the crop yield, say StormX. The current season is panning out very similar to excessively wet conditions that slashed wheat production in the state in 1999 and 1995. North Dakota is the second largest wheat producing state in the US, and the largest spring wheat state accounting for 50% of production. A sharp cut in the 2009 wheat harvest would clearly be very detrimental for United States bread wheat supplies, particularly when Texas drought and Oklahoma freeze damage are added into the equation, say StormX. Fields are saturated because of excessively heavy rain last fall and a thick snowpack that created flooding. Field conditions are similar to 1999, 1995, 1983 and 1972. In all four cases, production was sharply reduced compared with normal output, they add. Wheat planting was delayed by 2-3 weeks in 1999 and 1995 because of flooding. Drying occurred very slowly, stretching out the planting campaign into late May. In fact, not all wheat was sown by June 10th. Farmers eventually ran out of time to plant, which led to a 8-10% cut in the area sown. In summary, the cards are stacked against a favorable North Dakota wheat harvest in 2009, due to pre-existing wetness that inevitably will hinder planting and reduce the crop yield. A 25% cut in production is typical, when spring flooding is severe and similar to the present conditions, they conclude. Cold and wet weather is hampering attempts to advance spring grain planting in western and central Russia say StormX. Spring wheat, which accounts for roughly half of all Russian wheat, is mainly sown in Siberia, the Urals, and the Volga Valley, located just to the north of Kazakhstan. Since the start of April, 1-3” of rain has fallen, with the heaviest amounts falling over the Urals and Volga Valley, where rainfall has been over 200% of normal. Accompanying the rain has been temperatures 2-5ºF below normal. This combination of cool and wet conditions has produced soggy fields, which has delayed the planting of spring wheat, say StormX. The Russian Agriculture Ministry said on Wednesday that as of April 22nd, only 3.1 million hectares of spring grains have been planted, accounting for less than 10% of the expected planting area of 31.1 million hectares. On April 21st of last year, nearly 6 million hectares of spring grains were planted. SovEcon say that as of April 20th, only 2.9 million hectares of spring grains had been planted. The CTA Argentine workers’ umbrella union group yesterday staged protests, marches and walkouts across the country to demand salary increases and measures to protect workers from the effects of the global crisis. In the City of Buenos Aires, CTA’s demonstrations snarled traffic in the centre and roads into the the city for seven hours. "If the government does not hear our demands, we will meet next week to decide a national strike before the end of the month," said CTA’s deputy leader Pedro Wasiejko. The "national day of protest" was strongly supported, he added. "We are not going to get out of this crisis by the devaluation of the peso. If there are no underlying measures, we won’t pull out of the crisis," Yasky said and added that, although "the government is making announcements to redistribute wealth, they are not implementing them." The CTA and the ATE civil servants union staged a protest outside City Hall in Plaza de Mayo and then participated in a larger demonstration outisde Congress in the afternoon. The CTERA teachers’ union, health workers, and employees from the Cinema Institute and the Colón Theatre also took part in the demonstration. Demonstrations, roadblocks and strikes were also staged in several cities of Córdoba, La Pampa, Corrientes, Santiago del Estero, Santa Cruz, Entre Ríos and Santa Fe provinces. Meanwhile the heads of the Stock Exchange, Argentine Rural Society, Confederaciones Rurales Argentinas, Argentine Chamber of Commerce, Industrial Union, the Construction Chamber and the Association of Argentine Private Banks (ADEBA), gathered yesterday at the latter’s headquarters to discuss growing unease about the role of the state in the economy. Also on the agenda were dubious state statistics, coercitive pressure on businessmen, obstacles to trade and the steep decline of economic activity. It seems that nobody is happy with the way the Kirchner administration is running the shop at the moment. Certainly, this kind of turmoil isn't going to bring China rushing back to buy Argentine soybeans. The mid-term elections in Argentina are still two months away, that should keep China active in the US market a while longer yet. UK GDP fell 1.9% in the first three months of the year, according to the Office for National Statistics today. That is the biggest drop since Margaret Thatcher came to power in 1979, much worse than the 1.5% that analysts had been expecting and the 1.6% fall in the last three months of 2008. Cattles, the company that lends a few hundred quid here & there to bad risk borrowers to buy shell suits, fags & lager, suspended trading in its shares yesterday. The company said that it had found £850 million worth of "unexpected impairment provisions" relating to bad loans, sacked six senior executives and delayed the release of its FY figures. Another High Street retailer goes into administration, with Bay Trading forced to shut up shop after credit insurance against it failing to pay its bills was withdrawn following a £27.7 million loss announced Wednesday. It's not all doom & gloom on the High Street though, Debenhams reported half year profits up 10.7% to £104.2 million on sales growth of 6.1%. It says that its customers have more disposable income as mortgage & utility bills are falling. 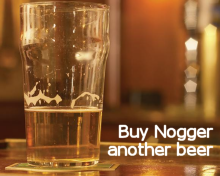 I think its down to those extra scanties I bought Mrs Nogger for Christmas. If they have got more disposable income, they aren't spending it a WH Smiths, they reported half year earnings down 5% as sales continue to fall. I'm not surprised, who hasn't thought to themselves "if I wasn't going on my holidays I think I might baulk at paying a fiver for a bottle of lucozade and a packet of wine gums?" EU wheat futures posted modest gains Thursday with Paris milling wheat ending up EUR2.00 at EUR145.50/tonne. London November feed wheat traded up GBP1.50 at GBP122.50/tonne. Weather worries around the world played a part today, with spring wheat planting severely behind schedule in the US. French wheat could so with some rain, as indeed could UK wheat. Large parts of the Russian grain belt around the Black Sea are also dry, and long range weather forecasts for this region aren't promising. Unusual warmth is likely for the May/June/July period, perhaps gaining in intensity as the summer advances. Dry conditions are expected to develop from Iran to western Russia, and possibly extend into north central Europe, according to StormX. Winter growing conditions have been drier than last year, they add. The December- February precipitation was only 75-80% of normal compared with 115-120% last season, leading to less stored ground moisture for spring growth and development. Argentina, normally one of the world's top five wheat exporting nations, is in dire straits. It's 2008 crop decimated by drought, slashed almost in half from 16 MMt to 8.3 MMT is about to begin planting its 2009 crop. Drought, political strife and now the credit crunch are hitting Argentine farmers hard. Gustavo Grobocopatel, president of the regional growing giant Grupo Los Grobo, said this week that at least a million acres less wheat will be planted this year. That represents a fall of more than 18% from the 5.4 million acres seeded in 2008. With a domestic consumption of around 7 MMT of wheat per annum, any exportable surplus that Argentina had has already left the country. The government have put a stop on export licences, and with virtually no wheat left to sell Argentine farmers are getting the cold shoulder from their banks when they ask them for credit to begin to plant this years crop. It's a potentially explosive cocktail, as without credit, fertiliser and pesticide applications will be the first to go out of the window, leaving the crop vulnerable to reduced yields in 2009. And this is a situation that isn't just happening in Argentina. World hunger and people dying in bread queues was headline new just a year ago, and that was before we started cutting back on farm inputs. Throw lower plantings and a weather problem or two into the mix and things could look very different twelve months from now. The Buenos Aires Grain Exchange cut its estimate for the 2009 soybean crop there to 36.2 MMT yesterday, from 37 MMT a week ago. That means that they have now lopped 3.2 MMT off Argy output in the last fortnight. Things could get worse still as they warn that it is "highly probable that the harvesting of the remaining area continues to deliver even lower yields in the north of Santa Fe and in the center, west, southeast and southwest of Buenos Aires and also in the northern Chaco and Santiago del Estero." The Argy Agriculture Secretariat have so far failed to come up with an April crop estimate, despite promising one due last Friday would be delivered on Tuesday. May corn closed at $3.81, up 7 ½ cents. A wetter outlook for the US Midwest was seen as further delaying corn plantings, whilst weekly export sales were again very strong at above 1.2 MMT. If exports continue at the kind of pace we have been seeing recently then a reduction in ending stocks is likely from the USDA. Funds bought an estimated 6,000 contract today. May soybeans finished at $10.37 ¾, down 8 ¼ cents, breaking through the 200 day moving average of $10.57, but unable to hold there. A rainier outlook for the US Midwest might lead to more bean acres this coming season. As with corn, weekly export sales were strong, and with old crop stocks already tight a further downward revision from the USDA might be in order before long. The Argy crop keeps getting lower, the Buenos Aires Grain Exchange have trimmed 3.2 MMT off production in the last fortnight. May CBOT wheat closed at $5.29 ¼, up 12 ½ cents. Wet weather in the Dakotas continues to hamper spring wheat planting. Minneapolis, where spring wheat is traded, finished up 15 ½ cents. It's a game of two halves further south with Kansas looking like having bumper winter wheat yields, but crops in Oklahoma and Texas decimated by drought and freeze. Weekly export sales reported by the USDA were pretty good. eCBOT closed with nearby beans again leading the way around 10-11 cents higher, corn and wheat closed around unchanged to slightly easier. After eCBOT closed the USDA released their weekly export sales report. Corn came in strongly at 1,214,300 MT for old crop plus 69,500 MT of new crop. Pre-report expectations were for sales of 800,000 - 1 MMT. Soybean sales were 617,100 MT for old crop and a very healthy 824,200 MT for new crop. China booked 186,300 MT of old crop and 232,500 MT of new crop, there were also new crop sales of 582,000 MT to "unknown" which often translates as China. Expectations were for sales of around a million tonnes. Wheat sales were 232,200 MT old crop and 199,300 MT for new crop, expectations were for 300-400,000 MT. May beans hit their 200 day moving average of $10.57 overnight, and closed within a gnats chuff of that at $10.56 1/2. Another week of decent export sales and the continued presence of China may see the market attempt to break through 10.57 this afternoon. If it can achieve that and hold there then there could be enough momentum to press on a bit higher yet, at least before US farmers get stuck into soybean planting. The Buenos Aires Grain Exchange trimmed it's production estimate for Argy soybeans again, this time to 36.2 MMT, that is now 2.8 MMT below the last USDA estimate. Spring wheat plantings in top producing state of North Dakota remain at a standstill after heavy flooding earlier in April. Japan bought 148,000 MT of wheat overnight with 86,000 MT coming from the US. US farmers, itching to get cracking with corn planting, will also be keeping an eye out for news from California this afternoon where there is a debate and vote for potential changes in ethanol policies. That could be negative for corn later in the day. Early calls for this afternoon's CBOT session: Corn futures are expected to open steady to 1 cent higher; soybeans 9 to 11 higher; wheat steady to 2 cents lower. A vote on carbon emissions policies in the state of Califormia taking place today is being closely watched by the US biofuels industry. The state's 2006 climate change law requires a 10% reduction in greenhouse gas emissions by 2020. The US ethanol industry is being treated unfairly it says, because the calculations used to evaluate emissions assumes that for every acre of land utilised to grow crops for biofuel, one third of an acre of pristine land is used. That assumption does more damage to the carbon footprint of biofuels than that of natural gas, crude oil or electricity as no such effect on the environment is taken into account for indirect emissions for those products, they say. Twenty one horses in the Venezuelan-owned Lechuza Caracas polo team dropped dead on Sunday at the US Open polo tournament in Palm Beach. The horses were said to have been administered a widely used vitamin supplement containing a combination of vitamin B12, sodium selenite and other minerals, which was apparently not approved for use in the US. Lechuza Caracas officially withdrew from the tournament on Monday. That's the trouble with these Venezuelans, all too ready to throw the towel in at the first little sign of trouble. Show me where it says in the rule book that the horses must be alive during the game. If it would have been the British team we'd have played on, coming last to the best of our ability, Eddie the Eagle style. We'd make our own polo horses out of supermarket trollies, with a papier mache head and a tail made out of bits of old material, wearing our Blue Peter badges with pride. "We owe it to the memory of our dead polo horses to play on and bring back the Cup for every man, woman & child back home. When I was a young boy growing up in Toxteth, we used to rush back home from school to feed our polo ponies. I'm not going to let a minor set back like this ruin my dream of lifting the US Open," said Team GB captain, Nogger, choking back tears, sat proudly in his improvised Tesco-sponsored pony. "It's got a bit of a wobbly wheel, so I don't know if he'll do the full 90 minutes, I might have to pull him off at half time and bring Aldi on," he added. Brazil is the world's largest exporter of beef and the world's third biggest importer of wheat. Russia is already Brazil's biggest beef buyer, taking more than half a million tonnes in 2008, around 25% of all Brazilian beef exports, but the South American country would like to sell Russia more. Russia is receptive to the idea, as the EU hasn't taken up its full quota this year, and it, of course, has lots of its own wheat to sell. There's just one problem, Brazil has a 10% import tariff on wheat imported from outside the Mercosur trade bloc. This means that most of the country's import requirements normally come form Argentina. But with the Argy crop almost wiped in half by drought in 2008, Brazil is having to look elsewhere to fulfil its domestic needs. Brazil's wheat milling association, Abitrigo, would like the government to drop the import tariff on 1.5 million tonnes of the country's estimated 6 million tonnes of required wheat imports. However, as the Brazilian millers prefer US or Canadian wheat, the government appears to be broking a deal to "encourage" Abitrigo members to buy Russian wheat in exchange for Russia buying more Brazilian beef. Exactly what form this "encouragement" may take is unclear, it would seem unlikely that the Brazilian Trade Chamber will drop the tariff on imports from Russia alone when it meets on Apr 28 to decide on the matter, that would have the US and Canada rushing to the WTO crying wolf. Bunge Ltd reported a first-quarter net loss attributable to common shareholders of $214 million or $1.76 per share, compared to net income of $270 million or $2.10 per share in the same quarter last year. Alberto Weisser, Bunge’s Chairman and Chief Executive Officer stated, “The start to 2009 was more challenging than expected. Bunge's first quarter results reflect this. Retail fertilizer margins in Brazil suffered from aggressive price reductions by competitors, which drove sales prices below international levels. Additionally, global demand for soybean meal was soft. Despite this difficult start, our confidence in a recovery in our markets and a solid performance in the second half of the year remains strong. “We are working through our higher cost fertilizer inventory, and the supply of fertilizer products in the Brazilian retail channel has been reduced by approximately 30% since the end of 2008 and is approaching historical seasonal levels. Both of these facts should improve margins as the year progresses. “Higher commodity prices, resulting from tighter global oilseed stocks, are supporting farmer economics, and should help stimulate sales of fertilizer products in the second half of the year when South America enters its next major planting season. Since mid- January, the USDA has reduced its estimate for global soybean production by nearly 15 million metric tons mainly due to weather-related production issues in South America. “Global soybean meal consumption in the first quarter fell by roughly 6% compared to the same period in 2008. While this figure represents a relative improvement over the 9.5% year-over-year reduction in the fourth quarter of 2008, consumption was slightly lower than expected. We are, however, seeing signs of stabilization in the poultry and pork industries, and we estimate soybean meal demand for the calendar year to be up about 1% versus 2008. US biotech giant Monsanto is suing Germany over its decision to ban the planting of its genetically modified corn type MON 810. Monsanto confirmed a report in the Handelsblatt newspaper that it had filed a suit in a court in the northern German city of Braunschweig, aiming to overturn the ban on GM corn. German Agriculture Minister Ilse Aigner said last week that the corn is dangerous for the environment, specifically Monarch butterflies and other insects. "There is a justifiable reason to believe that genetically modified maize of the type MON 810 presents a danger to the environment," she told reporters. The MON 810 strain is the only genetically modified corn variety approved in the European Union and was approved for commercial use in the EU in 1998. Crude oil stocks in the US rose to their highest level in nineteen years, according to data from the US Energy Dept yesterday. Inventories rose last week to 3.86 million barrels, well over a million more than had been anticipated, to 370.6 million. Meanwhile gasoline stocks rose 802,000 barrels, compared to expectations of a decline of 700,000 barrels. Inexplicably, US refineries upped their operations 3.1% last week, to 83.4% of capacity. Domino's report booming first quarter sales as the recession bites and staying in becomes the norm. Like-for-like Q1 sales were up 9.3% as British consumers sit in front of the TV on Saturday night's watching quality viewing such as the Domino's sponsored "Britain's Got Talent" whilst stuffing their fat putrescent faces with copious quantities of Spicy Hot Ones, swilled down with two litres of full fat coke. Online sales rose 31.7% as many customers can't now be arsed to stagger five yards to the telephone to place their order, preferring instead the intimacy & social interaction of buying via their PC. Presumably these customers also have their pizza's pushed through their letterboxes so that they don't have to wade though twelve months of unopened post to actually answer the door. Their lounges resembling the set of Wayne & Waynetta Slob's house with half-empty take out containers, mountains of ironing that never gets done, a child called Chantelle crying in her pram and a dog crapping un-noticed in the corner. "Our underlying trading during the period continued to show good growth. We are pleased with our current performance and trading continues to progress in line with expectations," said Domino's chief executive Chris Moore. Here's an idea for you Chris, take their giros direct from the government and organise for free pizza and two litres of coke to be delivered to every council house in Britain during the commercial break in Corrie. Inspired! EU wheat futures closed higher Wednesday with Paris May milling wheat closing up EUR2.50 at EUR143.50/tonne and London May feed wheat ending up GBP0.95 at GBP108.70/tonne. A strong dollar helped wheat nudge higher, although export interest for EU wheat still remains scarce. Dryness in France, Germany and the UK is a cause for some concern as far as new crop goes although old crop supplies remain ample. May corn closed at $3.73 ½, down ½ cent finishing slightly lower in a neutral stance on both old and new crop today. Estimates for tomorrow’s USDA export sales report are between 800,000 and 1,000,000 MT. An improved weather outlook in the Midwest over the next fortnight should finally enable US farmers to get cracking with corn planting. May soybeans finished at $10.46, up 8 cents as the spread between old and new crop continues to widen. Tight old crop stocks and the continued presence of China in the market seem set to keep things that way a while yet. Soybean export sales estimates are between 900,000 and 1,100,000 for tomorrow’s USDA report. May CBOT wheat ended at $5.16 ¾, up 7 ¼ cents. Weather concerns remain as North Dakota has yet to start planting and forecasts for the weekend there are cool and wet. That should continue to delay plantings. Sales estimates are between 300,000 and 400,000 for tomorrow’s USDA report. Hitler (never before mentioned on this blog, now twice in a week) had a dream of recreating the the extinct auroch, a legendary cattle breed believed to be the size of a rhino. The aurochs had been hunted to extinction in Europe by 1627. Zoologist brothers Heinz and Lutz Heck began the task of attempting to bring them back by breeding from modern cattle from the Scottish Highlands, Corsica, and the French Camargue, as well as Spanish fighting bulls. Their mission won the approval of the Fuhrer, who saw it as a symbol of Nazi supremacy in his quest for a master race. Most of the Heck cattle were destroyed after the war (who won that one again, it's slipped my mind? ), but a few survived, and now 13 have now been shipped from a conservation park in Belgium to Derek Gow's farm at Broadwoodwidger on the Devon-Cornwall border. The modern day Heck's are smaller than their mighty auroch ancestors, but still bear a striking resemblance to cave paintings. Who Is The World's Largest Importer Of Wheat? The answer, somewhat surprisingly, is Iran according to the USDA. They will import 8.5 MMT of wheat in the marketing year July 1-June 30 2008/09, just edging out Egypt (with imports of 8.2 MMT) for top slot. That's around 6.5% of the entire global wheat trade. One of the most striking things about this is that just four years ago Iran announced to the world that it had achieved its aim of becoming self-sufficient in wheat. Equally striking is that this means that Iran's imports in 2008/09 will be a staggering 4150% up on the previous year. Production in Iran for 2008/09 fell by a third on the previous year to 10 MMT the USDA say. Early indications for the 2009/10 crop are that the country will produce 13.5 MMT of wheat in the coming season, where the cereal is a major staple of the country's 70-million strong population's bread-and-rice-based diet. Production prospects here in the months ahead is certainly something that warrants keeping an eye on. "While it’s good to see businesses doing well in the recession, we shouldn’t lose sight of the fact that these huge profits have been built by exploiting small family farmers by paying them a pittance for their produce. "Tesco controls over 30% of the UK food market. There can be little doubt that a powerful supermarket monopoly has damaged farmers and weakened rural areas." Quite right too. I'd have liked him to have gone a stage or two further. "These profiteering bastards should be horsewhipped. They're cynically using the recession as an excuse to pass the full cost AND more of price cuts straight onto their suppliers with not a care in the world whether they sink or swim," would have been a start. Followed by a personal challenge to Sir Terry Leahy to an arse kicking contest. The minutes of the last Bank of England's MPC meeting showed that the vote to leave rates on hold at a historically low 0.5% was unanimous. Also just out in the news this morning, UK March jobless claims rose less than expected, increasing by 73,700 against expectations of 166,000. Unemployment in the UK is now running at 6.7%, in line with analysts expectations. The pound fell to $1.4550 and 88.75 pence against the euro on the news. The pound could be in for a bumpy ride today with employment data due out, and also the small matter of a Budget to contend with. The UK is expected to have lost another 116,000 jobs following February’s 138,400 which were the most since 1971. This is expected to bring the unemployment rate to 6.7%, which would be the highest since October, 1997. Until we see these numbers peak, further deterioration in the economy will be expected. The UK derives a considerable amount of its growth domestically and mounting job losses will only push out recovery expectations. This could weigh on the pound over the short-term. Minutes from the last Bank of England policy meeting are also on tap for release, before Chancellor Alistair Darling is expected to unveil soaring public borrowing when he delivers his second Budget later today. Right, I'm off out to buy some petrol, fags & a crate of scotch. Alistair Darling delivering his budgie last year. May corn closed at $3.74, up 4 ½ cents. Corn futures were higher at the end of the day with traders believing that the weather will interfere with corn planting and crop progress. It doesn't seem too likely to me. Crude oil stabilised, which also helped. May soybeans ended at $10.38, up 19 ½ cents, erasing much of Monday's losses. China continues to lurk in the wings, buying another 180,000MT of US beans overnight. These purchases are going to keep pushing old crop ending stocks tighter & tighter. Meanwhile not just the Argy crop, but also the Brazilian crop too, keeps getting smaller. May CBOT wheat finished at $5.09 ½, up 5 cents. Oklahoma, the second largest winter wheat producing state, reports 60% of its crop in poor/very poor condition after the deep freeze of two weeks ago. Texas says that its crop is now 74% rated in the bottom two categories. It's a good job that conditions in top producing state of Kansas are improving. EU wheat futures closed a little higher Tuesday, supported by a steadiness in outside markets like crude oil and equities. May Paris milling wheat traded up EUR2.75 at EUR141/tonne, whilst May London feed wheat traded up GBP0.25 at GBP107.75/tonne. A deterioration in US winter wheat crop conditions helped to support EU wheat along with a firm US dollar. Farmers are reluctant sellers at current levels, and with legitimate concerns over the size of 2009 crops in Western Europe, who can blame them? 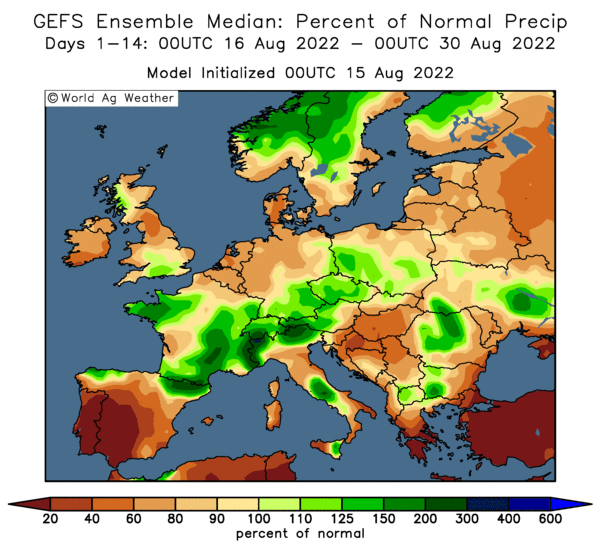 Drier than normal conditions have been prevalent throughout not just the UK, but also France & Germany over the past three months, threatening yield potential. Soybean yields in Brazil's Rio Grande do Sul are proving to be very disappointing as the harvest progresses in Brazil's most southerly state, and the country's third largest producer of soybeans. Brazil's supply agency CONAB recently pegged their output estimate for Rio Grande do Sul at 8.3 million tonnes. Private consultancy firm Emater however have revised their estimate down from 8.4 million tonnes last month to just 6.7 million tonnes citing severe drought in tha last couple of months. Losses could be even more severe with the application of tillage, says the head of Embrapa-General of Passo Fundo, Gilberto Cunha. eCBOT grains closed slightly firmer in Tuesday's overnight session, with May wheat up 4 1/4 cents, May corn up 1 3/4 cents and may soybeans 3 1/2 cents higher. Last night's planting progress report showed corn planting lagging behind schedule at 5% done, compared with the five year average of 14%. That shouldn't really be too significant as the weather is finally forecast to warm up, and some marked progress is likely to be made over the next couple of weeks. Spring wheat plantings are also well behind at 6% done, compared with 21% normally, with nothing at all planted in North Dakota yet. That is a pretty significant number when you consider that that particular state normally accounts for half of all US spring wheat production. Ideally, the state would expect plantings to be half done by May 1st. Winter wheat production in the US meanwhile is likely to be exceptionally variable this season. Crops in the top producing state of Kansas appear to have escaped significant freeze damage a fortnight ago by virtue of their late development. In Oklahoma and Texas however it's a different story, where 60% and 74% respectively of winter wheat is now rated poor or very poor. Japan is tendering for 148,000 MT of wheat this week, of which 86,000 MT is US origin. Syria is planning to buy 200,000 MT of soft wheat this week, and South Korea bought 110,000 MT of corn overnight. For soybeans the Chinese rumours won't go away, China may have bought up to a million tonnes of US/Brazilian beans in the past week despite US prices hitting six month highs, according to trade gossip. Crude oil is stable for now at $45.90/barrel, having dropped by almost 9% yesterday. The May contract expires today. Doubts that the worst is over for the US economy emerged, despite Bank of America reporting better than expected profits yesterday, after US economic indicators came in lower than expected. Crude oil inventories data due tomorrow is expected to shows stockpiles rising a further 2.4 million barrels last week. Early indications for this afternoon's CBOT session: corn, beans and wheat all called 1-3 cents higher. The Saudi Arabian Grain Silos and Flour Mills Organisation (GSFMO) plans to import 700,000 tonnes of wheat by August to add to the 470,000 tonnes its has already imported since September, 2008, it says. The move comes after the Saudi government announced plans to abandon a 30-year-old programme to become self-sufficient in wheat that has severely depleted the desert kingdom's water resources. Saudi Arabia produced 2.3 million tonnes of wheat in 2008, eight percent below its level a year earlier, according to the USDA. The Kingdom's own domestic wheat harvest may fall as low as 1.2mmt this season, due to sharply lower plantings which are now being actively encouraged by the government. The country bought 495,000mt of mostly Canadian wheat at the end of March. Shares in AIM-listed D1 Oils jumped more than 30% yesterday after the company announced that it was looking to raise capital by selling a "substantial" share of the D1-BP Fuel Crops joint venture it co-owns with BP to plant and harvest jatropha. D1-BP Fuel Crops is looking to expand its operations by planting 220,000 jatropha trees, and says it needs further investment to develop ways of expelling and storing the oil it gets from the plant. Jatropha produces an inedible oil feedstock for biodiesel and is able to make use of land not suitable for arable agriculture. D1 shut down its biodiesel refineries in Middlesbrough and Bromborough in 2008 blaming the widespread "splash & dash" practice for their non-viability. According to F. O. Licht, total world grain use for biofuel production in 2009 will increase to 109.4 MMT from the 98.1 MMt utilised last year. The US are easily the largest global consumers of grain for biofuel, using 95.3 MMT in 2009, up from 87.4 MMT in 2008. The EU will use 5.9 MMT, they say, up from 3.9 MMT a year ago. The members of the farming organizations liaison committee are scheduled to meet later today at 10am local time with the leaders of the Unión-PRO coalition, to discuss the situation of the agricultural sector, the Rural Society reported yesterday. Buenos Aires Mayor Mauricio Macri and Dissident Peronist Deputies Francisco de Narváez and Felipe Solá, who will all be candidates for Congress in Buenos Aires province, will meet with the four farm leaders today at the headquarters of the CRA rural confederations, in the City. Solá and De Narváez sided with the farmers last year during the conflict they held with the national government over a hike in export duties, and since then they have been defending their demands. On the agenda for discussion is likely to be the governments announcement over the weekend that they are to press ahead with plans to nationalise the country's grain trade from May 1st. Mid-term elections in Argentina are now re-scheduled for June 28th. Hungary accounts for 50% of the 1.35 MMT of EU grains offered for intervention, according to the latest data. Record yields in 2008 pushed Hungary's wheat crop up 42% from 2007, with barley output 45% higher. The bulk of the remaining offers also, unsurprisingly, come from Eastern Europe with the Czech Republic accounting for 13% and Slovakia 10%. The US winter wheat crop is in a strange situation where promising crops seem to be getting better whilst poorer crops getting worse. The USDA last night reported 43% of the crop rated good/excellent, that's a one point increase from last week. The percentage of the crop rated poor/very poor however also increased, up two points to 27%. Wheat in the top US producing state of Kansas appears to be improving in potential, whilst in Oklahoma and Texas things are going from bad to worse. The key factor in all of this seems to be the stage of development that the wheat crop was at when it was hit by a big freeze a fortnight ago. Crops in the more southerly states of Oklahoma and Texas were more mature and therefore more critically affected by temperatures well below zero for several hours. "Irreversible damage occurs in the boot stage, when the grain head emerges from the leaf sheath to be pollinated, but Kansas wheat was just starting to joint," says Gail Martell of StormX. "Oklahoma wheat is expected to have severe yield reductions in the western and southwestern crop districts, because the freeze caught wheat in the reproductive stage. The Oklahoma wheat rating deteriorated for the second week in a row, reflecting devastating losses, and is now 30% very poor, 30% poor, 28% fair and 12% good," she adds. In Texas things are even more bleak for wheat, with 74% of the crop now rated poor/very poor, up seven points from last week. Meanwhile spring wheat planting remains well behind schedule with just 6% of the crop in the ground compared to 21% normally, said the USDA. The recent heavy flooding in North Dakota means that that state has yet to plant any wheat at all. Recent analysts estimates point to up to 1 million acres of land intended for spring wheat in ND may not get planted. Corn planting meanwhile is 5% complete, well behind the five year average of 14%, but things are expected to catch up rapidly for corn over the next couple of weeks with warmer temperatures on the way for much of the corn belt. Inflation in the UK turned negative in March for the first time since March 1960. The RPI was -0.4% as mortgage and fuel costs fell, say the Office of National Statistics. The news was pretty much as expected, indeed many thought that February's RPI might come in negative when in fact it was 0.0%. The consumer price index also fell from 3.2% in February to 2.9% in March. So there we have it, deflation is amongst us. How long will it last is the sixty trillion dollar question? You will note that I've modernised that saying, as sixty million is bugger all these days. Associated British Foods' shares leaped Tuesday following a better than expected half yearly performance. Profits dipped just 2% to £275 million, and the company said that it expects a recovery in the second half. The figure was better than analysts expectations of £245-268 million. Primark delivered almost half of the profits, chipping in with £122 million, an increase of 10%, a Primark employee was too busy having his nappy changed to comment. Shares in ABF were up 48p to 702p in early trade. Tesco has reported pre-tax profits up 10% on the previous year to £3.13bn, with sales topping £1bn/week for the first time at £59.4bn for the FY. These figures are the highest ever for a UK retailer, and are all the more shocking when you consider that like for like sales at Tesco grew only 3% in the year, around half that of the sector average, and well below the likes of Morrisons who recently reported 7.9% growth. "We're slashing prices to help our customers in these difficult times," or something along those lines I remember reading from Tesco not that long ago. There's only one person you are helping Mr Leahy and we can all see who that is. Data from the British Retail Consortium (BRC) recently revealed that food inflation was 9% in February and March, up from 7.5% in January and 6.2% in December. So food prices in the supermarkets are going up, your profits are up to record levels, yet prices at the farmgate are going down. "It's all the market will stand, these are very difficult times for all of us, the consumer simply won't pay any more," my arse. May corn closed at $3.69 ½, down 6 ¾ cents. Crude oil had a bad day at the office, down almost 9%, to close at $45.88 a barrel on renewed worries over the US economy. The DJIA was also lower, adding to the negative tone. After the close the USDA reported corn plantings just 5% done, well behind normal for this time of year. May soybeans closed at $10.18 ½, down 32 ½ cents. Falling crude oil & equities hurt beans today, despite talk of China remaining a keen buyer of US beans. Warmer US weather will help planting progress in the next couple of weeks. A sharply higher dollar also added to soybeans woes. May CBOT wheat finished at $5.04 ½, down 18 ½ cents. An improved US weather outlook and weaker outside markets pressured wheat from the off. Planting progress for spring wheat is at 6% compared to the five year average of 21% and last year at 19% in the six states that plant 98% of the spring wheat. The USDA said after the close that winter wheat is now rated 27% very poor to poor, that's two points up from a week ago. EU wheat futures closed narrowly mixed Monday as the market still struggles to find some much needed direction. May Paris milling wheat ended down EUR1.00 at EUR138.00/tonne. London new crop November feed wheat closed up GBP0.50 at GBP118.50/tonne. A firmer dollar added some support for EU wheat, although weaker crude oil and falling equities took the shine off early gains. US markets opened sharply lower, with an improved weather outlook for the week ahead set to boost corn plantings there. EU weather conditions meanwhile remain warmer & drier than normal for this time of year, coaxing winter wheat and rapeseed out of dormancy. This could lead to yield problems further down the line. 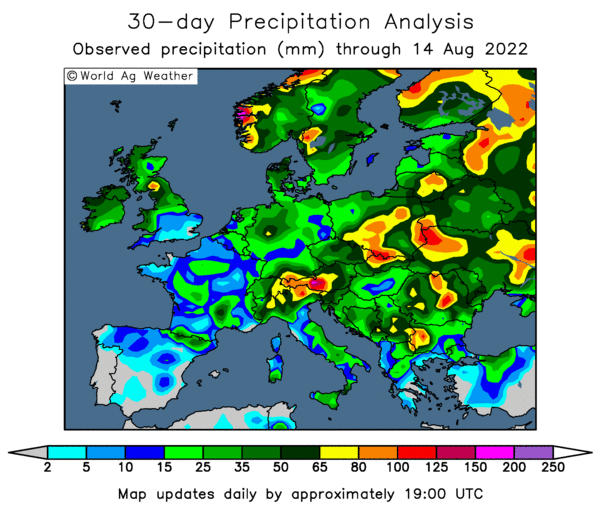 Western Europe remains largely dry with significantly below normal rainfall in the top European rapeseed countries France, the United Kingdom and Germany say StormX. Less significant rapeseed areas in Denmark and Sweden are also unfavourably dry, they say. Scattered showers brought some relief to rapeseed farms last week, but not enough to offset high evaporation with increasing heat and sunshine. April temperatures have warmed up sharply after a cool March in Western Europe. Most days, temperatures have reached the mid 60s, or higher. 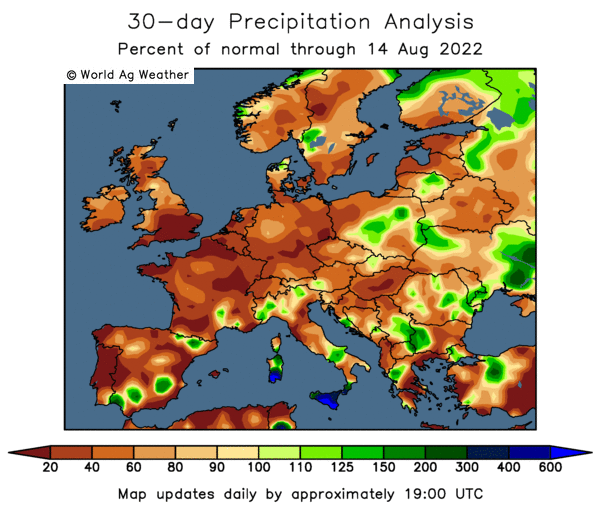 StormX's 7-day European rainfall forecast is revised lower, featuring less coverage of moderate-heavy rains. Previously showers and thunderstorms were expected to be heavy and widespread in Western Europe, they say. The overnight eCBOT grains closed sharply lower, dragged down by a firm dollar and falling crude oil and equities. Nearby May soybeans traded as much as 13 cents higher earlier in the session buoyed by reports of continued Chinese interest, but couldn't hold onto those gains closing 9 1/2 cents weaker. Nov beans finished the session sharply lower, down 22 1/2 cents. Corn and wheat closed with losses of around 8-10 cents each. May beans hit a six month high of $10.73 Friday, before profit-taking trimmed gains, on reports that China had bought a million tonnes of US and Brazilian beans last week, shunning Argentina. As well as the Argy crop continuing to shrink the political situation is seen as being too volatile at the moment to make Argentina a reliable supplier. The government there announced over the weekend that it was pressing ahead with plans to nationalise the grain trade, which will doubtless cause further upheaval in the ongoing dispute with farmers. Strikes, or at least the potential for further strikes, will likely keep foreign buyers wary in the run-up to the end of June elections. The Agricultural Secretariat withdrew its delayed March soybean crop estimate last month saying that it contained errors. Its April report was due to be released Friday, but that never materialised either. The market initially traded higher Friday after the Ag Sec was seen nipping to the shops for some tippex, the report is now expected out tomorrow, once it dries. The Buenos Aires Grain exchange now peg the soybean crop at 37 MMT, and the Rosario Grain Exchange at 37.3 MMT. The weather in the US is finally set to warm up, which will be conducive for corn plantings, as soil temperatures rise. The 6-10 day forecast is also favourable. The USDA will release their weekly planting progress report after the close tonight. Last week corn plantings were just 2% complete, I don't think things will have advanced much this past week, but significant progress should be made this next fortnight. Crude oil fell out of bed, tumbling more than $2.50/barrel, and is now back below $50 at $47.76/barrel. The Dow is expected to open lower, although the largest bank in the US - Bank of America - announced a surprise Q1 profit of $4.2 billion. After Citigroup, Wells Fargo, Goldman & JPM all reported better than expected earnings recently there is some optimism that the worst is over. If stocks can manage a rally later in the day then session lows might be made early in the day for the grains. Early calls for this afternoon's CBOT: Corn futures are expected to open 8 to 10 lower; soybeans 10 to 12 lower; wheat 10 to 12 lower. Just a couple of weeks after after saying that full-year figures would beat forecasts, Yorkshire-based food producer Cranswick announced it had agreed to buy competitor Bowes of Norfolk Ltd., from the Bowes family for GBP 17.2 million cash. Today, it has recouped virtually all that money back in one fell swoop by announcing the sale of its petfood side in a management buy-out. Cranswick Pet Products (CPP) and Tropical Marine Centre (TMC) will be sold for GBP 17 million to a consortium of the management teams of each, headed by TMC MD Derek Black, whilst it will retain a 5.5% share in the business, say Cranswick. StormX concur, soil temperatures in the Corn Belt have warmed to above 50ºF in the shallow 0-4” layer with mid-upper 40’s now found in the 4-16” depth thanks to last week’s mild and dry conditions, they say. Despite the recent rain and potential for a bit more early this week, no rain is anticipated during the impressive midweek warm-up. This should allow the deeper layer of soil to approach the important 50ºF for corn planting, while fields dry out. This is great news for farmers that are already experiencing planting delays. Over the past few months, the soggiest fields have been found in northern and central Illinois. This area still faces the most significant prospects of planting delays as wet fields may limit the effect of the warm spring sunshine, they add. The Argentine state will resume oversight and issuance authority of grain and oil seed trade permits starting May 1, a government resolution appearing yesterday in the Official Gazette as General Joint Resolution 2595 said. The measure "is aimed at enhancing as well as improving the whole chain of grain trade and especially producers and hoarders," Federal Revenue Service (AFIP) head Ricardo Echegaray yesterday said. The new trade scheme will be "free of charge, transparent and safe," Echegaray explained. Yeah right on Ricardo baby. I'm getting the word... strike. I'm indebted to Claudia from a certain German-owned shipper, who emailed me this morning to point out that today was Hitler's birthday. Presumably they all throw a big party or something? Anyway, he'd be 110 if he was still alive, so I rang my local Primark store and asked to speak to him. "Can I speak to Hitler please?" "Hitler, it's his birthday today, he's 110." "Don't be silly, that's the combined age of our entire workforce of seventeen." As Australian farmers thoughts turn to the coming 2009/10 crops, lower plantings are seen across the board according to the National Australia Bank. "The area planted to winter crops in southeastern Australia is forecast to fall considerably in 2009-10, underpinned by depleted soil moisture profiles and farmers' reluctance to increase debt levels to fund winter cropping programs, given the poor seasonal outlook," they say. Although plantings in NWS and Queensland are expected to come in around unchanged from year ago levels, overall a 5% reduction in winter wheat acreage is anticipated, giving a final crop of around 21.2 MMT, assuming that weather conditions during the growing season are reasonably favourable, they say. Barley area is seen down 4.4% producing a crop of around 6.5 MMT, whilst the acreage given over to rapeseed will see the sharpest decline - down 22% - producing a crop of just 1.3 MMT, they add. The reason for the large fall in rapeseed plantings is predominately the high cost of inputs, say they bank, warning that output could fall further if drought delays the commencement of plantings.